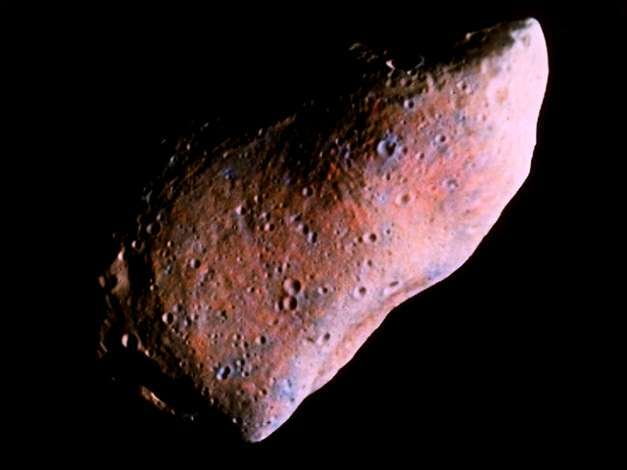 Information: This picture of asteroid 951 Gaspra is a combination of the highest-resolution morphology and color information obtained by the Galileo spacecraft during its approach to the asteroid on October 29, 1991. The Sun is shining from the right; phase angle is 50 degrees. The base image is the best black-and-white view of Gaspra (resolution 54 meters/pixel) on which are superimposed the subtle color variations constructed from violet, green, and near infrared (1000 nanometers) images taken in an earlier sequence at a resolution about 164 meters/pixel. The very subtle color variations on Gaspra's surface have been artificially exaggerated here; to first order Gaspra's color is fairly homogeneous over the surface. However, subtle albedo and color variations do occur and are correlated with surface topography in a significant way. In this false-color view, the bluish areas represent regions of slightly higher albedo, which are also regions of slightly stronger spectral absorption near 1000 nanometers, probably due to the mineral olivine. These bluish areas tend to be associated with some of the crisper craters and with ridges. The slightly reddish areas, apparently concentrated in topographic lows, represent regions of somewhat lower albedo and weaker absorption near 1000 nanometers. In general, such patterns can be explained in terms of greater exposure of fresher rock in the brighter bluish areas and the accumulation of some regolith materials in the darker reddish areas. Gaspra is an irregular body with dimensions about 19 x 12 x 11 kilometers (12 x 7.5 x 7 miles). The portion illuminated in this view is about 18 kilometers (11 miles) from lower left to upper right. This color picture results from a joint effort by image processing groups at the U.S. Geological Survey in Flagstaff, Arizona, Cornell University in Ithaca, New York, and JPL.